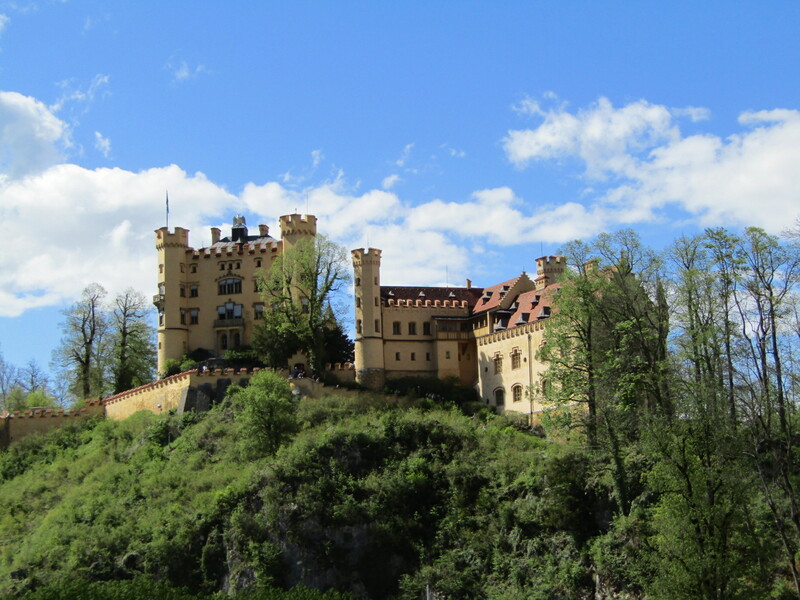 The Romantic Road (Romantische Straße) runs approximately 200 miles from Würzburg to Füssen linking 28 scenic historical towns along the way. Moving south towards the Alps we decided a leisurely romantic drive would be preferable to Autobahn tedium and the accompanying wobbles as vans pass our caravan at unrestricted speeds. While the scenery in parts is breathtaking, especially further south as the Alps loom into view, the majority of the three hour journey was spent following convoys of HGVs travelling at exactly 40mph, quite dull and distinctly unromantic really. The appearance of the mountains also heralded an increase in temperature forcing us to deploy our, currently temperamental, air-conditioning for the final run into Garmisch and our next tour site of Camping Erlebnis Zugspitze, site review HERE. Once again, the site was completely different to the preceding ones and seemed to be one third Motorhome Aire, one third Caravan/Motorhome Pitches, one third seasonal. The weather forecast for the next three days was atrocious but it was the same across the whole area so we planned to sit it out at this site and give up any chance of sightseeing. On that basis this stopover turned into a pleasant bonus. A mandatory local tourist tax, Grrrr, got The Boss grumbling, included free bus and train tickets for the town, Hooray, and by gosh we intended to get our money’s worth. 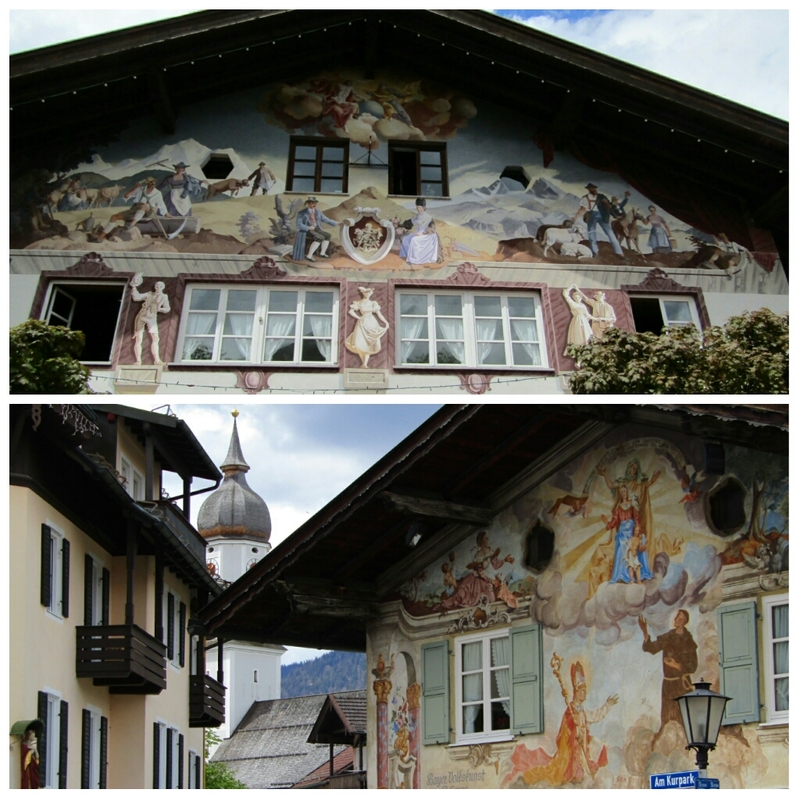 To be truthful this turned out to our advantage, first, a bus ride from the campsite door into Garmisch for a quick mooch, admiring the buildings adorned with full facade murals and elaborate window frame murals. 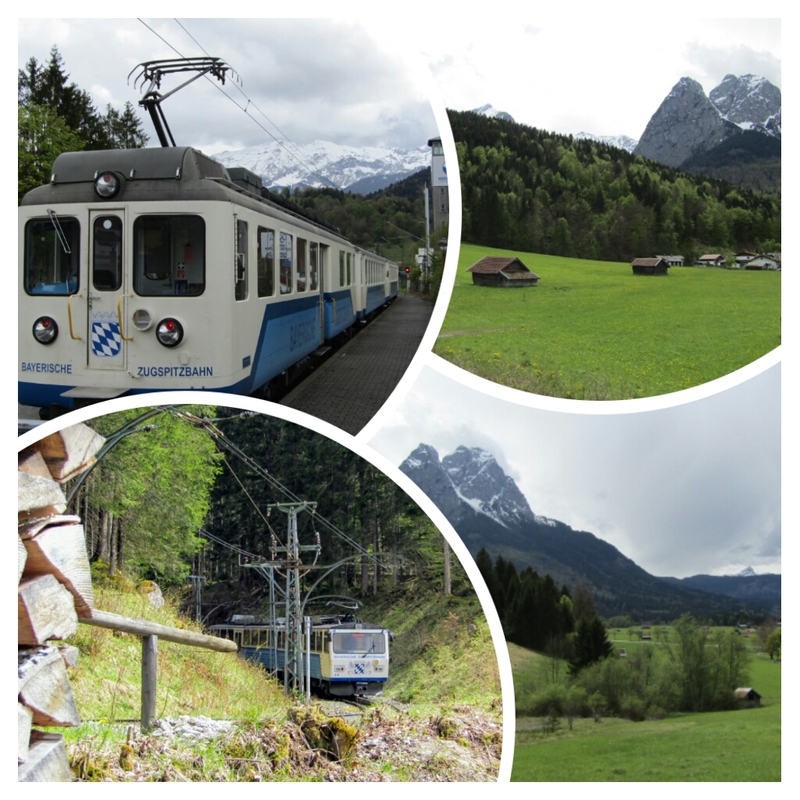 Next we headed for the town railway station to the furthest platform where a small three carriage Alpine train awaited to take us back past the campsite to Eibsee Lake at the foot of Germany’s largest mountain, Zugspitze. For approx €50 each we could have continued up the mountain on the Zugspitzebahn Cog-Wheel train, had the skies been bright blue we would have considered paying this sum, we once baulked at a similar price to go up Mont Blanc before coughing up and enjoying one of the most amazing experiences of our lives. Not today, clouds were brushing the summit, and that weather forecast! Money stayed safely moth balled in his wallet. 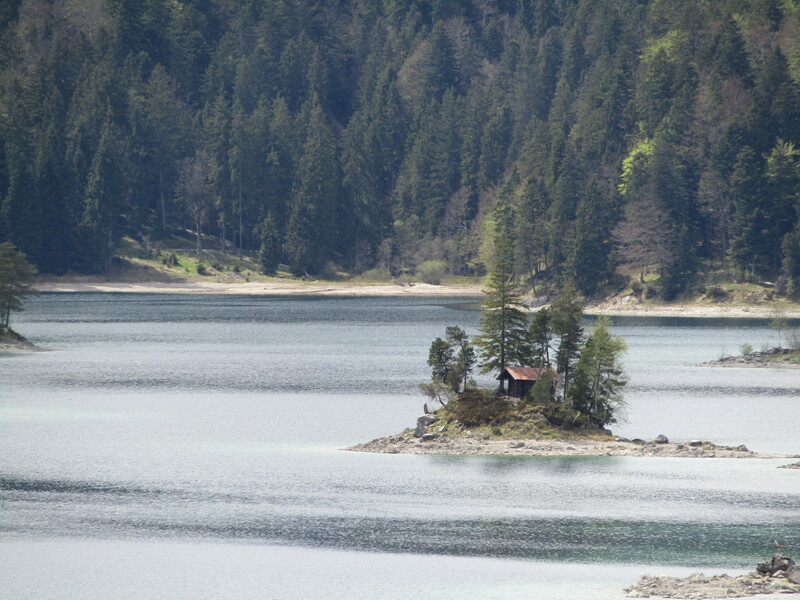 A couple of photos at Lake Eibsee and this time back on the bus to the campsite door. No, The Boss has other ideas, he has spied an opportunity to row on the lake. I am not so sure, I see disaster, upturned boats, a cold swim and lost worldly goods. Too late, he is heading for the counter and in his best ‘useless’ German saying “Ruderboot, sechzig minuten bitte”, to which the assistant responds, “No problem, nine euros please” in a Californian accent, clearly we look English, must be the socks, sandles and knotted hanky. I even get told that I speak Oxford English, my Boltonian twang mustn’t be very strong today. As The Boss rows us to the centre of the lake, in glorious sunny weather, he tells me how he has always wanted the romantic experience of a rowing on a beautiful lake in silence but for the gentle sound of oars as they leave the water, and my heartbeat as I await the capsize. It was indeed beautiful, and even a little romantic to drift along in the shadow of Mount Zugspitze. Rowing back was less romantic and more Steve Redgrave as the wind was blowing against us and our time on the water was running down, even Californians need to clock-off work. Water was no longer gently dripping from oars and was now splashing everywhere as The Boss unsuccessfully pretended he wasn’t sweating. Back just in time, California man dragged the boat out of the water and was next seen sat in front of us on the bus home. Mr Itinery Man, another nickname The Boss has picked up over the years had another plan the following day, which involved driving from Germany to Germany via Austria which also required a drive to the local petrol station for the Austrian ‘road toll’ Vignette we needed anyway for the next campsite, but first we take another free bus ride to nearby Grainau for a walk around the village before noon and our dinner. After food we jumped in the car. He often tries to keep me in the dark, which is another way of saying there are steep hills to walk/ride and I would refuse to go. By god if I’d’ve known the hill I was going to climb I would’ve been moaning at breakfast rather than half way up it. 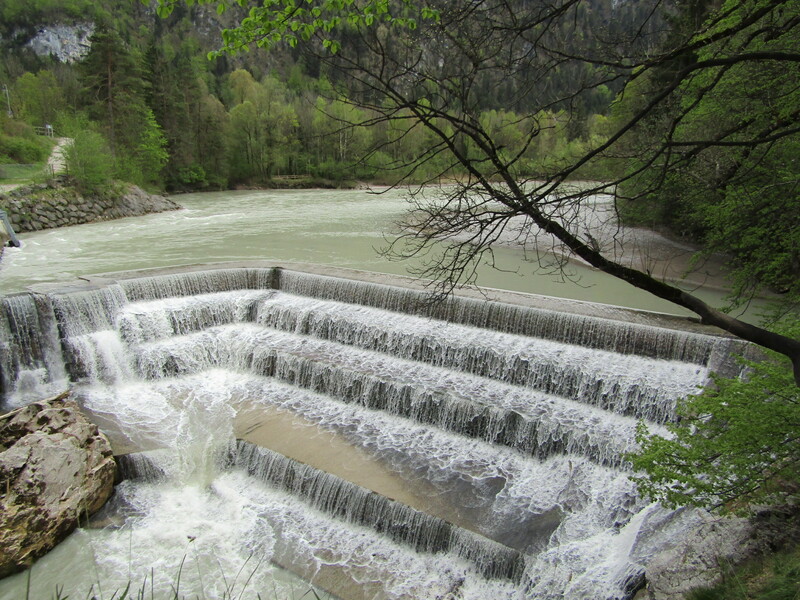 Having a sat nav that was built before most of the roads in Europe adds to the mystery tour but within the hour we park up on the edge of Füssen to see an interesting stepped waterfall and gorge carved through the rocks two hundred years ago to save Füssen from floods. 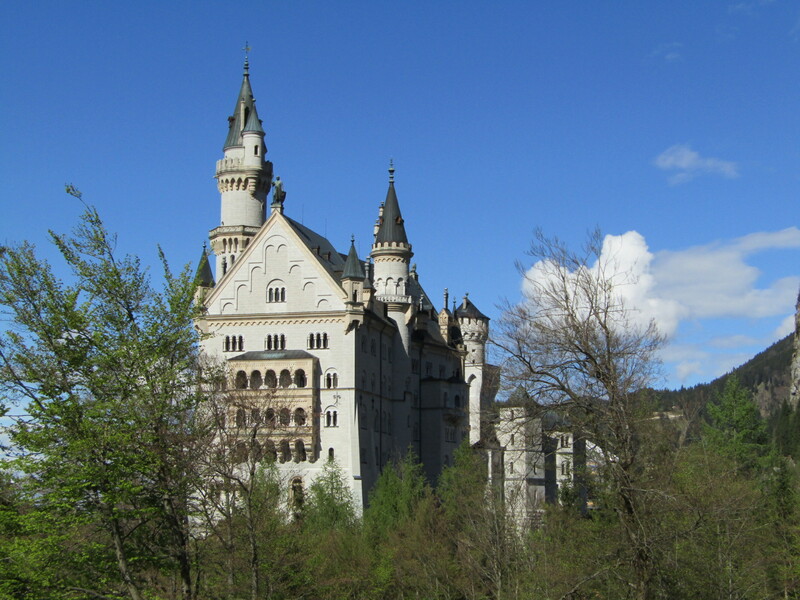 A further five minute drive and we spot the Fairytale Castle of Neuschwanstein Castle high on the hillside, I start to suspect the next part. 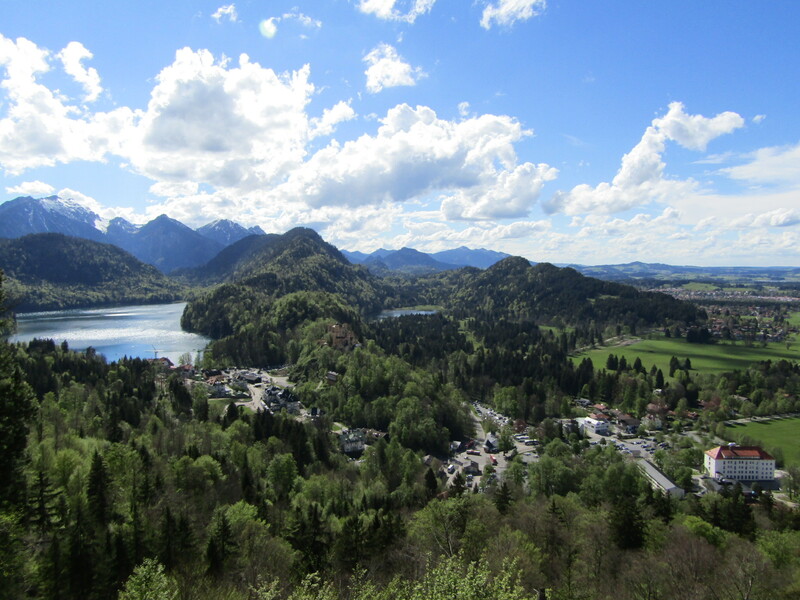 Luckily, there are four large car parks and a visitor centre/ticket office nearer to the castle, actually there are two castles, Hohenschwangau Castle is in the same area and both are separated by a forty minute walk, did I say walk? Climb up a Tarmac road. We could have gone by horse drawn carriage but The Boss’ mind and wallet have a ‘no pain no gain’ operating system. The car park was €6 for a day ticket and day tickets to both castles would have cost us approx €25 each, we had no intention to go in, partly because a long tour forces us to be selective with expensive attractions, but mostly because we find 80% of the experience and beauty is in the scenery and setting and the other 20% inside often looks like opulence and riches seen elsewhere but at a cost. To be clear, if we were longer in the area we would go in but we were quite happy today to look from outside. As we walked (climbed) the hill I was convinced this was the Chitty Chitty Bang Bang Castle, later confirmed by Google and some Facebook friends, it also turns out to be an influence on the Cinderella Castle, ‘bippity boppity boo’. Large horses pulled carriages up the hill leaving deposits as they went, no sooner had it landed when a drive-on road cleaner was sucking it away, I’d like to see that job description, ‘Equine emissions clearance officer’ maybe? We finally reached the castle only The Boss sees another path going further up the hill, he senses my limit is reached and without wishing to lose any more Romantic effect goes alone while I rest. He returns fifteen minutes later talking of breathtaking views for one last effort, but no, I’m done. He often jokes/complains how I would climb ninety nine steps and ‘give up’ when one more step reveals a stunning reward. 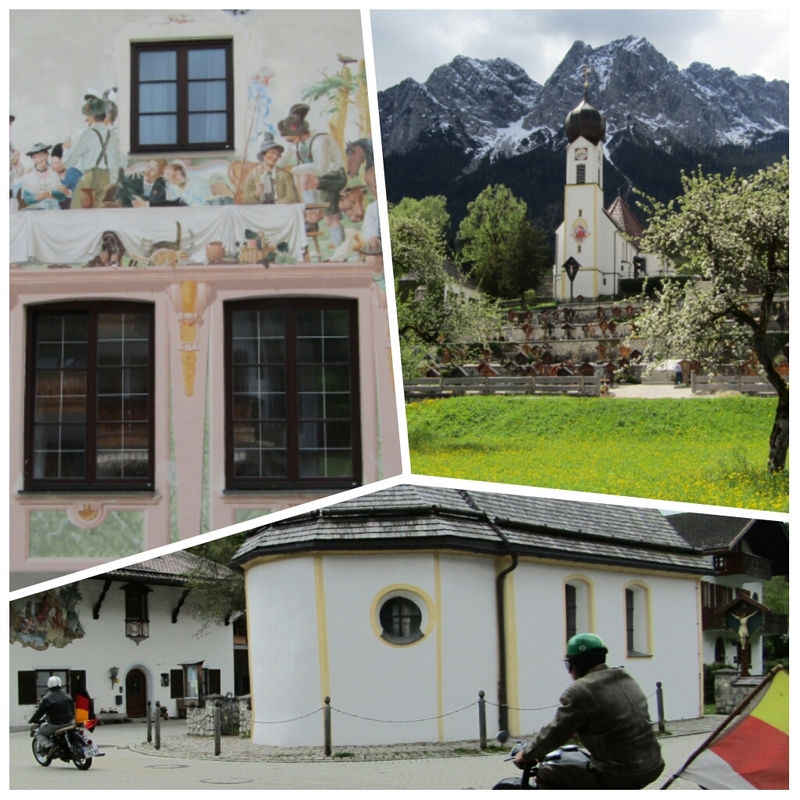 Back at the site, via Austria, we settle down for our final night in Garmisch. We have no site booked for tomorrow but are now comfortable with the idea of just turning up (we are off-season after all). Two Italians are practically leaning on our caravan while they point at, discuss and laugh at our caravan Aquaroll water tank and Wastemaster water collector, it seems a very British feature and has been raising many European eyebrows, glad we are offering some entertainment. enjoying your blog as we are hoping to do a similar trip in September. Just wondering what ‘the continentals’ use instead of aquarolls and wastemasters? Although I know they make more use of the site facilities for showers and washing up etc … perhaps they can get by without anything? sorry didn’t mean to post twice, there was a delay and I thought I hadn’t done it right! That hill! We too were too tight to pay for the bus or horse wagon. I vainly thought if I took it slowly I’d be fine, the Hubster had to pull me up the last bit! Brilliant ! Better than my Danielle Steel ! Wish we were younger and had your drive to do this Keep us posted and glad you are enjoying it Watch those frogs ! It seems like the frogs were being romantic too! site we stayed at in The Netherlands had water and waste to each pitch which was rather luxurious. I don’t get the love of communal washing up though! If you ever pass through Austria you must try Camping Natterer See, nr Innsbruck. The facilities are better than some high class hotels, currently pitched lakeside for a few euros per day. enjoying your trip – we are hoping to do something similar in September. What do ‘the continentals’ use instead of aquarolls and wastemasters then? Hi Morna, there seems to be a complete reliance on facilities, eg, showers, washing dishes and toilets. Plus they tend to buy drinking water. Many Euro Caravans have fresh water tanks like motorhomes and they catch waste in bowls.